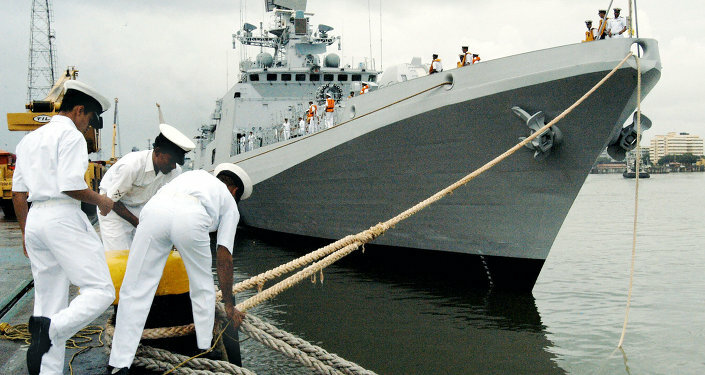 Indian Naval Ship (INS) Airavat arrived in Brunei on Sunday to take part in the ASEAN Defense Minister’s Plus (ADMM Plus) drills on countering terror and maritime security, the Indian Navy said in a statement. NEW DELHI (Sputnik) — The ADMM exercises are taking place on May 1-9 this year. "In consonance with India’s ‘Act East Policy’ and Indian Navy’s constant endeavour to enhance maritime security in the Indo-Pacific, Indian Naval Ship, INS Airavat arrived at Brunei on 1 May. The ship will participate in the ADM Plus (ASEAN Defence Ministers’ Meeting Plus) Exercise on Maritime Security and Counter Terrorism from 1 May to 9 May, 2016," Indian Navy spokesman Cap. D K Sharma said, as quoted in the statement. INS Airavat is a Landing Ship Tank, indigenously designed and built in India. The ship has a lift capability of 500 troops, 10 tanks and 11 combat trucks. Airavat may be used for a variety of missions, including amphibious operations as well as humanitarian assistance and disaster relief. During the exercise, the Indian Navy is expected to engage with participating navies from Brunei, Singapore, Indonesia, Philippines, Thailand, Vietnam, Malaysia, Myanmar, China, Japan, Russia, Australia, Republic of Korea and the United States, through professional interactions in harbor and complex operations at sea, the statement said.